NITE Team 4 is a story-driven military hacking simulation game with strategy and RPG elements featuring cyberwarfare scenarios. 894 backers pledged CA$ 67,494 to help bring this project to life. Dev Update #12: New Story Option! Dev Update #11: Stretch Goal #3 Reached! Dev Update #10: New Rewards Added for Final Week! Dev Update #08: Stretch Goal #2 Reached! Dev Update #07: Stretch Goal #1 Reached! Dev Update #06: 100% Funded - Thank you! Dev Update #02: 50% Funded in 24 hours! Alice & Smith is thrilled to announce our partnership with Funcom! The creative teams of both companies will work together in several ways, including a hacking mission to be released within The Secret World and a special cross-universe ARG (What is an ARG?) quest available to the communities of both games. NITE Team 4 will make an appearance in The Secret World with a military-style backpack gear item, available for free to all TSW players. It’s the perfect item for infiltration and recon operations. Use it to store your infected USB drives, keyloggers, wireless auditing tool kits and more! The Secret World players who back our campaign will also receive access to an exclusive cross-universe ARG mission, plus limited edition NITE Team 4 uniforms that can be worn by their characters in The Secret World! 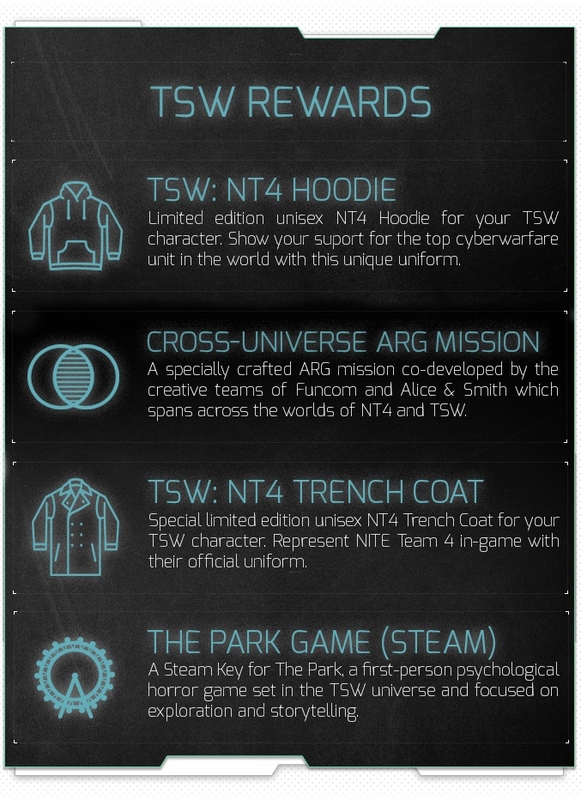 See the Backer Tiers chart for more information on these TSW rewards. NITE Team 4 is a story-driven military hacking simulation game that explores the world of cyberwarfare and features realistic mission scenarios. It will be released on Steam for PC and Mac. You play as a new recruit in the covert hacking cell, Network Intelligence & Technical Evaluation (NITE) Team 4. Engaged in cyberwarfare with black hat groups and hostile states, you will be in a struggle to penetrate highly secure targets. Your job is to use the STINGER hacking system to infiltrate hardened computer networks and coordinate strike teams on the ground to carry out missions that feature real espionage tradecraft terminology taken straight from leaked NSA documents. During our time developing the Alternate Reality Game The Black Watchmen, a project we successfully funded on Kickstarter, we frequently came across stories related to the world of government hacking groups and intelligence analysis. These subjects were incredibly fascinating and inspired much of the content appearing in NITE Team 4. We want to do something new in hacking games and bring this secret world to life. Our time spent producing Alternate Reality Games and events has given us the skills to craft immersive narratives unlike any other. This is not going to be a game about a lone hacker, we want to deliver an engaging experience that puts you in the ranks of the most powerful cyberwarfare unit on the planet. In NITE Team 4, players will have access to a virtual hacking platform based off real systems (Kali Linux/Metasploit). 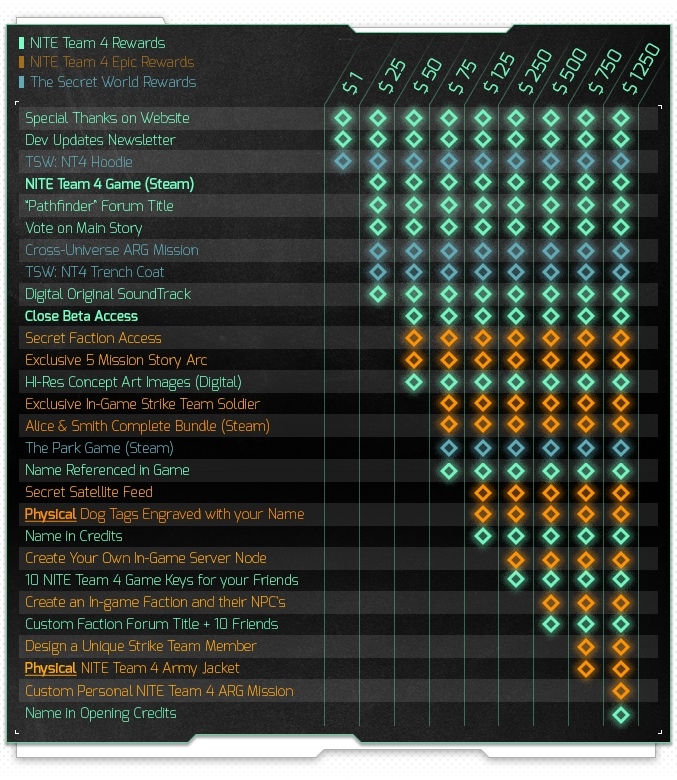 Each mission is broken down into distinct phases including Recon, Exploitation and Raid. In the Recon Phase, players will be performing research and investigative tasks to learn all they can using actual espionage tradecraft. Utilize reconnaissance tools to map networks, fingerprint systems and gather intelligence that will help you uncover possible weaknesses in the target organization. After gaining a thorough understanding of the enemy, players will move to the Exploitation Phase where they will use hacking modules to exploit and gain a secure foothold into the target. Customize your attack strategy by leveraging all the offensive system tools at your disposal. Finally, the Raid Phase begins where players will work with military teams on the ground to provide specialized support and direct units to effectively compromise an entire facility/organization using highly advanced cyberwarfare equipment. Ensure your team is well equipped to defeat threats on the ground, facility security controls and network defenses. The STINGER system is a specialized interface that allows players to control hacking modules and use custom tools to deliver an immersive hacking experience. Direct troops to perform raids in support of field operations like covertly implanting devices with malware, targeting drone strikes and sabotaging target. Mission campaigns feature espionage terms and references, sourced from leaked NSA documents in the Snowden archive. Inspired by actual systems like Kali Linux and Metasploit. From Advanced Persistent Threats to covert malware projects that destroy critical infrastructure, NITE Team 4 is inspired by the real world of cyberwarfare. We bring this world to life using our 2+ years of Alternate Reality Game development experience and optional ARG elements that enhance the immersion of the universe (websites, research online, etc). Sometimes NITE Team 4 operations require so called “off-net” activities to breach hardened areas. This is when the Off-Net Intrusion Group (ONIGRU) is called into action. They coordinate with NITE Team 4 members to complete the necessary tasks on the ground that will allow a successful penetration into a target site. The Remote Operations Center (ROC) is the base of operations for NITE Team 4. It is equipped with state of the art data visualization and analysis software. All major operations are coordinated and executed within the ROC. Sophisticated anonymization technology obscures the source of any cyberwarfare strikes and makes attribution of NITE Team 4 attacks incredibly difficult. Agent Wheeler is a senior agent in The Black Watchmen's Archive & Records division. She is a specialist in Big Data analysis and database management. NITE Team 4 relies on her skills to quickly find the information they need and gain insights on collected intel. *All names used in game must not be trademarked, offensive or in any way problematic for us to include in the game. *All Add-On prices are in Canadian Dollars. If you are not Canadian, you can calculate how much you will need to add to your pledge here. Help spread the word of NITE Team 4. The most effective way to ensure the game is funded and expanded with stretch goals is to share this project on your social networks: Facebook, Twitter, Reddit, Tumblr, Instagram, gaming forums, blogs, etc. Join in the propaganda effort and help extend the scope of NITE Team 4! We read about the possibility of a hack on the Global Positioning System in a news article. It painted a grim portrait of how reliant some systems are on GPS and the potentially devastating consequences of GPS failure. We wanted to explore the idea of a hacker gaining access to the command center of this system and what kind of damage they could do. After the hack performed by North Korea on Sony Pictures Entertainment in 2014, we wanted to know more about the cyberwarfare capabilities of this secretive nation state. We found out that North Korea had conducted wide scale cyber attacks on South Korea in 2013 with a malware known as “DarkSeoul”. The idea of NITE Team 4 being asked to stop another impending cyber attack by North Korea was exciting and became our second campaign story. The concept of software that could defend and attack hackers sounded like science fiction. But it turns out, the NSA didn’t think so and actually developed something like this. It’s called MonsterMind and supposedly it’s capable of retaliating against hackers on designated networks. The possible implications of a system like this and the problems it could cause if not configured correctly, were what inspired our third campaign. NITE Team 4 was originally a hacking team in the Permanent Alternate Reality Game The Black Watchmen and still exists within that narrative universe. The STINGER hacking terminal was introduced in a Black Watchmen mission as a website interface and asked players to research actual computer exploits. The overwhelming amount of interest we received from players about the STINGER terminal showed us the potential for a stand-alone version of the game. In The Black Watchmen, you are an agent of a paramilitary group dedicated to protecting the public from dangerous phenomena beyond human understanding: ritualistic murder, occult secret societies, and paranormal activity, to name but a few. As a global organization, The Black Watchmen offer a wide range of skills and services for covert missions anywhere in the world, on behalf of any group, corporation or government that can afford them. Often called in as a last resort, The Black Watchmen pride themselves on their discretion, strength and efficiency. NITE Team 4’s cyberwarfare capabilities ensure the strength of the Global Agent Network. Live Events involved dead drops hidden in various cities, interactions with actors, recon photos, phone calls, mail puzzles and much more. The Black Watchmen universe continues to expand with Ahnayro: The Dream World’s ethereal explorations into a veiled reality [Now on Steam] and a newly launched Special Ops DLC: Mother Russia. Andrea Doyon - Producer: The head producer at Alice & Smith, Andrea is a creative geek with a mission: “make your life fun.” Andrea has lectured on the importance of cybersecurity for both large corporations and dynamic startups. Nathalie Lacoste - CEO/Producer: Nathalie is an Art Historian (late 19th century to 1930) with a specialization in the semiotic language of fashion, and costume in art. She is fascinated with the “modern Esprit” and the “Sleen” of that period. Nathalie is the founder and CEO of Alice & Smith, and concentrates on the big picture ideas of the studio while ensuring all the details are in place. Fred Forges - Game Design, Graphic Design, Lead Developer: Fred is our go to man for almost everything. Game design, programming, web development, image and video editing - it’s all Fred. His keen eye for design and detail will give NITE Team 4 its distinct aesthetic and feel. When he’s not blowing our minds by the amount of work he can get done in a single afternoon, he is busy playing games and watching a whole lot of Netflix. He also enjoys playing hockey and guitar and has a cat named Korben Dallas and a really cool dog named Marlène who hangs out at the office sometimes. Steven Patterson - Game Design, Writing: Steven grew up with a strong interest in technology, hacking and Japanese culture. Section 342.1 of the Canadian Criminal Code hasn’t been used against him yet and hopefully won’t be in the future. Steven’s background and interest in cyberwarfare is contagious, nearly anyone he speaks to about it will come away awed at the scope of Computer Network Operations today. While absent from the game design table, Steven enjoys struggling to speak Japanese and researching other games (aka playing them until the early morning). Patrick Greatbatch - Game Design: Patrick’s interest lies in the occult, the paranormal and the delicious. With a background in film and television, Patrick made the move to game design in 2011 with a grassroots ARG for a sci-fi web series based in Montreal. He has worked alongside Steven, on games, puzzles and scavenger hunts ever since. When he is not researching NSA leaks and Stuxnet, Patrick spends his time biking, cooking and hanging out with his two cats. Vincent Chevalier - Developer: Silent and deadly - international man of deception, Vincent is a mystery wrapped in an enigma wrapped in a man who is very good at coding. Our studio has had a recurring fascination with the world of cyberwarfare over the last two years and we've planned multiple hacking themed events for our Alternate Reality Game, The Black Watchmen. We realized that there was the potential for a full, stand-alone hacking experience inspired by actual modern day civilian and military computer security tools. We are now coming to the Kickstarter community to help realize this potential. We have created a funding goal of $30,000 to build a strong story campaign with online (cyberwarfare), off-net (tactical field units) and out of game (alternate reality) components. You can discover more about our capacity to create a truly immersive experience in our 84-page behind-the-scenes report on our development process. We believe that we have the skills and passion required to bring a truly novel experience to the gaming community. We have successfully completed a Kickstarter campaign in the past for The Black Watchmen and are aware of the common challenges associated with running a Kickstarter. We know that sometimes backer rewards requiring a high degree of customization or interaction with the design team can take longer than usual. If we experience any delays in delivery of backer rewards, we will be sure to speak directly with the people affected and do our best to keep everyone informed. That being said, the biggest challenge for NITE Team 4 is to create a truly immersive experience for all phases of the game (cyberwarfare / off-net tactical field intervention), while keeping a balance between accessible and realistic. As a self-financed indie studio, we recognize that we don’t have the $500k+ budget of a larger studio. But, in the last two years we have learned how to be efficient and flexible with an extremely minimal budget. Like most game projects, there may be unexpected issues or changes. We understand that making a game is a complex and challenging process. To mitigate risk, in February we launched an Alpha version of the game that was tested by over 200 players. This helped us a lot and we plan to revisit the strategy of sharing prototype versions throughout the development process. Whatever may happen, we’ll be sure to be as transparent as possible and value our community’s time. Your name will be added to the Special Thanks wall on the NITE Team 4 website for all to see and follow the full dev process with a subscription to an exclusive newsletter. Earn your vote on the main story line of NITE Team 4, get the Original Soundtrack, show off a special "Pathfinder" forum title and play the completed game. Gain access to an additional 5 exclusive missions exploring the story of a secret hacking group. Plus get an early look at the game during the Closed Beta. Enlist the help of a special Strike Team member (and learn their history in a hidden side mission), see your name referenced in the NITE Team 4 universe plus play through the full Alice & Smith game library. Hone your mercenary skills in a series of solo side missions outside the operations of the agency, immortalize yourself in the game credits plus show your support with custom engraved NITE Team 4 Dog Tags. Create your own server node in the universe of NITE Team 4 which others can hack and explore, then invite 10 of your friends to play the game and see the contribution you made to the world of NITE Team 4. Name an in-game faction and their NPCs, then work with the dev team to create the group's backstory. Give your personalized faction forum title to 10 of your friends. Name and create custom Strike Team Member with the dev team, plus get a customized BDU jacket featuring the NITE Team 4 logo, army patch and personalized name tape. Dive into a unique online mission customized to your playstyle and preferences, including ARG elements and NPC interactions, plus get your name in the opening credits. Become a corporate partner, have your company featured in the game and help us expand the NITE Team 4 universe. A full day immersive ARG experience in a mystery location, all included.